A disastrously-broken canal ahead & another lash of The Beast From The East #England #narrowboat – The Diesel-Electric Elephant Company. Not the sort of thing you stumble across every day, fortunately. These photographs are obviously not mine, but are the ones seemingly freely circulating all over the “news” outlets and the “The Social Media”. In the distance here you can see Stanthorne Lock (top of frame). I have no idea who deserves credit, but THANK YOU! 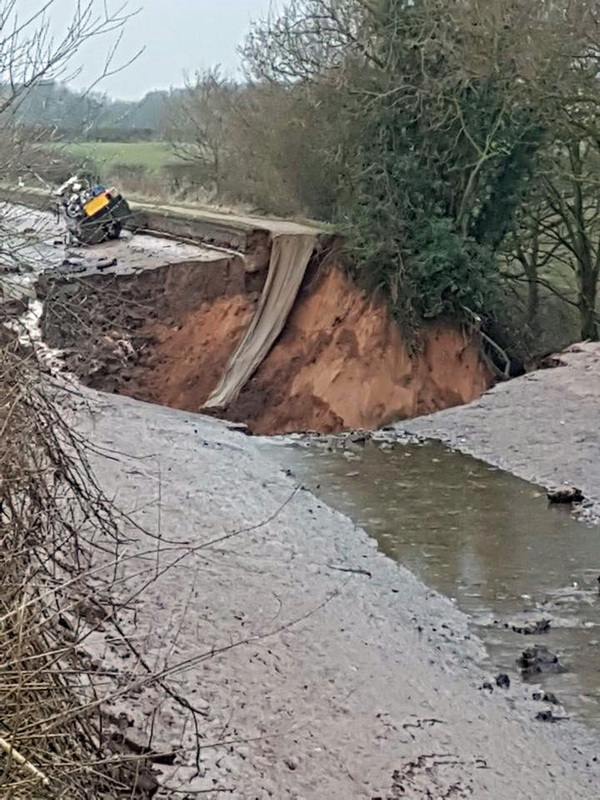 A ruddy great section of an aqueduct embankment near Middlewich has collapsed. The ancient aqueduct itself below, carrying the canal over the River Wheelock, remains intact (it seems), but a stretch of canal from Stanthorne Lock to Wardle Lock (right in the heart of Middlewich) was somewhat suddenly and unexpectedly drained onto farmland below. That is a boat that you can see above the breach, it is someone’s home and the gentleman was aboard at the time of the breach – about 11:40pm (ish). He was rescued by Messrs Police & Co at about 1am. His boat is canted over at an angle because, I think, it is a “Springer” and has a v-shaped hull. The breach, last time I heard, was still growing, and there are doubts in re the boats survival. The chap has been given a temporary bed by another stranded boater. Relatively early stage of the breach. That is a boat, there was a man living aboard and he is safe and rescued. His boat, however, may not see many more days, sadly. I suspect that this will take at least a couple of days to sort out. Boated up and down there a couple of times in past months, and walked that pathway into Middlewich (and Messrs Tescos supermarket) many, many times. There are two locks between the Cardinal and me and this breach, and about eight miles of canal. It was the direction that I was headed in, and in about a week I should have been there. I think that I am a Jinxian, this is the second attempt to travel in that direction and the second closure. “Closure” in this second instance seems to be a rather inadequate term! Dead bicycles and old mattresses – people do tend to use the canal as a rubbish dump. Show a few of the obstacles that we navigate when trying to move along or moor up! The Cardinal and I have the option of reversing a couple of hundred yards to the winding hole just behind us, or of going down the first of the locks ahead and turning then to go back from whence we came, again. It is not going to be a cheap or quick fix for this one. To add spice to the HP Sauce, yonder the “The Beast From The East” is back again for seconds. Yesterday was mild, possibly the mildest day since I forget when (it seems to have been a long winter). Last night the winds returned (East Nor’East – right onto the Cardinal’s bow) and the temperature is dropping like a stone. Below zero already, and the wind-chill factor is +/- Gadzooks, where are my longjohns. It won’t be making the job of assessing and containing the damage any easier. The local news services and even that once great but now embarrassingly awful journalistic endeavour, the BBC, are full of “barges” being stranded left, right and centre. A barge is not a narrowboat and a narrowboat is not a barge, and folk on both get very annoyed by folk without either boat or barge mis-using the names! Tis a flogging offence! Just goes to show. My Dad told me this when I was knee-high to a magistrate. If a news item that you know about is woefully inaccurate in almost every detail, including the truth, what are the odds that every other item from the same source is equally woeful? I think it might have a lot more to do with building on sand and then not tending to the trees that were the only thing holding the bank together! It is amazing what a couple of centuries of gentle neglect can do. I have Mr Stove working his socks off on an “all you can eat” basis, there’s food in the galley and just a tiny, tiny smidgen of internet signal. Plenty! Yesterday, while someone else’s troubles were not so far away, I manually emptied the gazunders (a la “walked them” to the services), fetched potable water (from a different source, also a walk along the towpath carrying) and did a long-overdue job called “the laundry” (two hours over a hot twin-tub). Industrious, or what? Under “Canal Time” rules three jobs like that can take a whole day, and be knackerising! Ho et le hum, another day today, another guinea. I am once again hunkered down on my boat with the way ahead blocked. Plus ca change, plus ca go another way, Sunshine. Tis all good fun – but only because I wasn’t a few days ahead in my schedule, when it might not have been any fun at all, ever again! So not only the roads in poor state, then. I lived my youth in this part of the country. A pity to see such a sight. Seriously, the canal system ought to be a nationally-funded, protected treasure. Instead it’s been hived off to a private company hiding behind a faux-charity (to fiddle the taxes) and will never, ever get the love, care and investment that they need to survive. I’m exploring the system while it still has (some) water in it! It was a shock indeed when I heard about our canal the other day. Apparently the man on the boat slept through the whole collapse, so I’m told! There are now up to 20 boats stranded on the stretch up to Wardle Lock, awaiting rescue. We stood on one of the bridges to have a look on our way home from school on Friday. I also know that some Canal and Waterways volunteers rescued a large number of fish and eels on Saturday, and put them back into the canal at the other end of town. Yes, I was planning to take the dog for a long walk tomorrow morning after school drop-off, but he’s a fair-weather pooch and might not agree to it… I shall just have to take myself instead! We used to walk in the area around the breach, before we had children (it’s tricky terrain with a toddler), and it always floods in wet weather – now it looks like a lake down there! Badgers, eh? I’m hoping this doesn’t provoke a crackdown on the creatures. Better go after Putin instead; he’s already persona non grata, after all. I have to say my thoughts on badgers are based 100% on Mr. Badger in The Wind in the Willows. I love the description of his underground house. So not an informed opinion. Where I live, it’s urban deer and feral rabbits that are blamed for all sorts of things. But I dare say users of the British canals must be wondering if there are other disasters imminent. And fixing the one that has happened will be an expensive headache. I’ve been watching “Great Canal Journeys” with Timothy West & Prunella Scales on YouTube and they often talk about the trees that line many canals as part of what anchors things and keeps the banks stable. It’s a lucky thing that no one on a boat or the path was injured or even killed – but what a shock it must have been to the poor fellow caught in the worst of it. I suspect you are very correct about this taking a good long while to get sorted! If it’s any consolation – while yesterday was lovely & sunny, it was -15C with the windchill when I went out yesterday – this winter is starting to feel endless! Stay warm. Hi Margie – it does seem to have been a long winter this time, even though I love winter I am getting to be fed up with this one. Spring almost had us for a few days last week, everything began to come alive again, birds and flowers, and then wallop, back to full winter. Tim and Pruney are one of those love ’em or hate ’em parts of the establishment. I love ’em – even though I am not fond of their views about boating being a “contact sport”. If you’re a millionaire and the boat is your plaything, maybe, but not if you aren’t and it’s your home! They have both been fantastic actors in their time, and I too enjoyed all of their canal programmes. I wonder if I will be as brave as they, and explore Eire’s canals and some of the French canals… eventually? Tis indeed spectacular – and I am so happy not to have been near nor by at the time! I’ve not heard whether the chap who was on that boat has needed several large brandies and a good gibbering session, but I would imagine as much. I’m astounded his boat wasn’t sucked backwards into that sink hole. The water pressure must have been incredibly strong. Sitting, watching, wondering….-shudder-. I’d say let’s give him a whole crate of brandy. He deserves it. Say safe Ian and preferably stay afloat, You can always come back to Wales and make your third assault on that section when they’ve fixed it. A very sad sight indeed. 😦 … may the dropping temperatures and snow bits not impede your about-facingness. Tis indeed a tad of a shockette – not least for the poor chap on the boat that was moored right alongside the breach! Many thanks for the re-blog, sir! Surely makes for an eye catching lead photo!!!!!!!! Putin did it?????? How can the world blame anyone, but my President?!?!?!?!?! I am truly amazed!!!!!!!!!!!!!!!!!!!!! I know you have complained occasionally about a shallow canal, but was this drained one shallow???? Because if not, then those shallow ones were merely puddles! I’m glad you were not in midst of it! I suppose those who were will have to pay someone to lift them out. And THAT can’t be good for a narrowboat. Not that sitting on mud is good for one. Just thinking about the nightmare’s many terrible aspects is anxiety inducing. Related to nothing at all: An extraordinary number of bikes in the bottom of a canal, aren’t there? 2 in just that one picture. Do bikers drink and therefore mistake the canal for the towpath? Someone should call Poirot in to investigate that and the gun. It’s a sign of my nationality that I didn’t understand why that gun was extraordinary. sigh. I wish I was as agog over it as the news is. That’s about the depth of most of the canals now. In their commercial load-carrying days they would have been dredged more vigorously (money involved…). The Cardinal scraped his bottom most of the way up and down the Llangollen canal, and we have a 27″ draught! Heavier, deeper boats such as the laden fuel boat have to stick to the centre of the channel a lot of the time and just can’t get near the sides. That is some hole; I hope the poor chap who lived on the boat will get compensation. I also hope that no lives were lost. I wonder if there will be some kind of survey to identify other possible dangers? Stay safe m’dear. It always pays to bimble, rushing about can seriously damage your health, or your #narrowboat; thank goodness you are a bimbler! A visitor recently was complaining about the potholes on our roads at present; it’s all a matter of perspective and awful for the poor chap if he loses his home. Does waterways insurance cover ‘sink holes’ I wonder and that must have been one very large badger or was it a badger gang? Fearsome whatever the cause, although I still favour the Putin attack drone disguised as a heron or stork or whatever it was you caught on camera! Stay safe Captain Curry the fluttering white stuff is crossing over towards you! Seriously, it might well have been badgers or rabbits tunnelling, it only takes one tiny breach for the water to begin to flow and then the water does the rest. The trees that were planted to keep the embankment together haven’t had any serious love in a long, long time but have been left to their own devices. I agree though – Putin did it. He is known for his dislike of the Middlewich Branch of the Shropshire Union canal.